I was thinking of including the prices of my clothing at the end. I am a self-proclaimed "recessionista", after all. Perhaps I should make it a bigger focus to help you guys find great deals. What do you think? Do you care to know the prices, or does including them just muck things up? I love it, you are so cute! 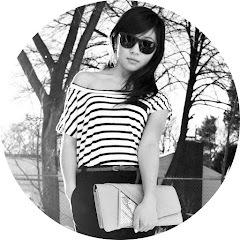 oh and I like your outfit and layout of your blog.very cute! My favorite part of this look is the top! So cute! That red skirt is amazing! Love the color. awwww you're soooo adorable!! Just found your blog and its soo cute! Love the stripes with the pink! you look so cute! the outfit looks amazing on you!